I've been wanting to update my skincare routine for a while and feeling a bit bleh about myself was the perfect incentive to start having a snoop around some routines that would be suitable for my skin that is almost as problematic as me. 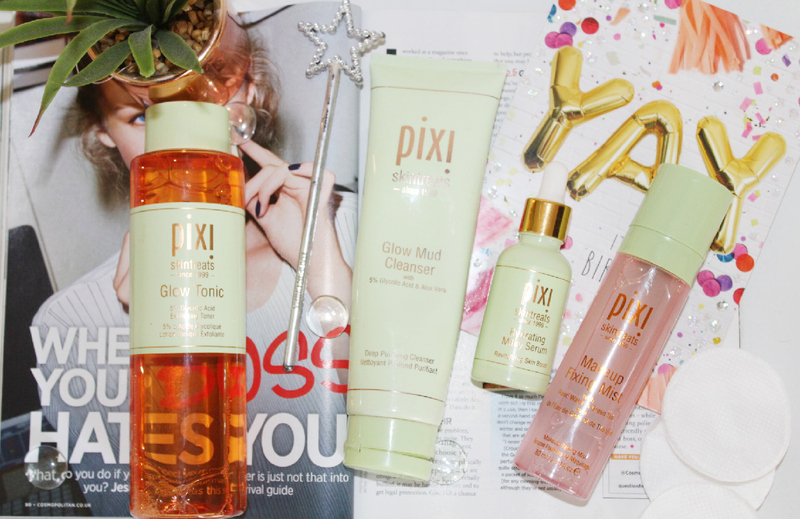 After perusing some of my favourite blogs, I decided I was going to treat myself and try out some products from Pixi, it's not often I'll go all out and buy full sized products for my skin let alone a whole haul but I had an inkling that Pixi might be the one for me, and I was right. 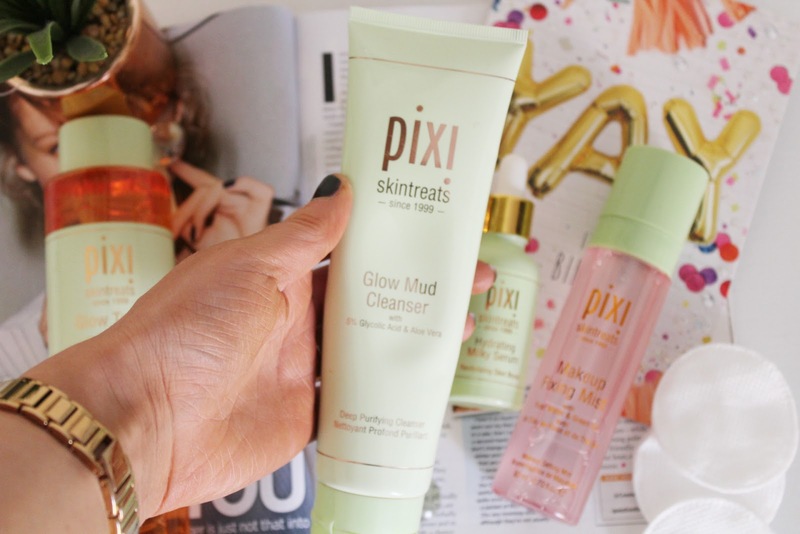 Naturally, the first product I hunted down was a cleanser and out of the selection it was the Glow Mud Cleanser that appealed to me the most. This is the first cleanser that I've used in a long time that genuinely feels like it's actually cleaning my face rather than just resting on the surface. The Glow mud cleanser provides very gentle exfoliation that works to sensitively remove dead skin and is enriched with 5% glycolic acid and sooting botanicals that work to deeply cleanse pores and provide a healthy glow. 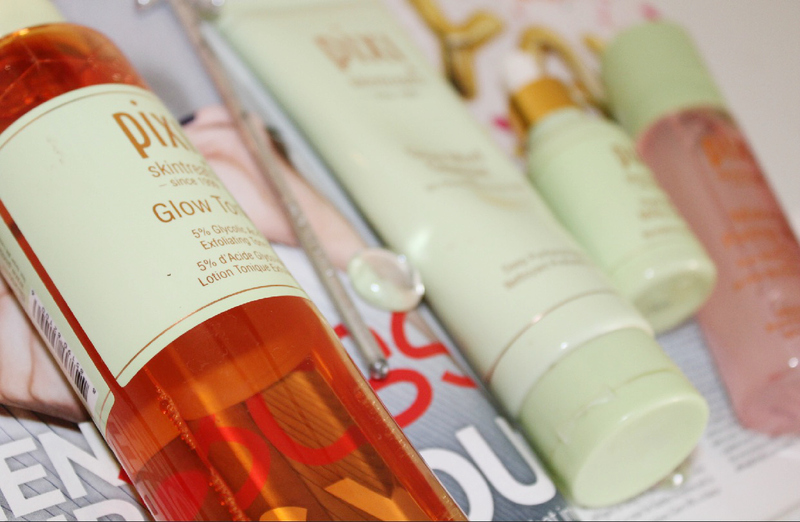 The glycolic acid also works with the mud to even the complexion by removing blemishes. I have found a lot of other cleansers either don't do anything to my skin or, make it angry and dry and impossible to settle down. 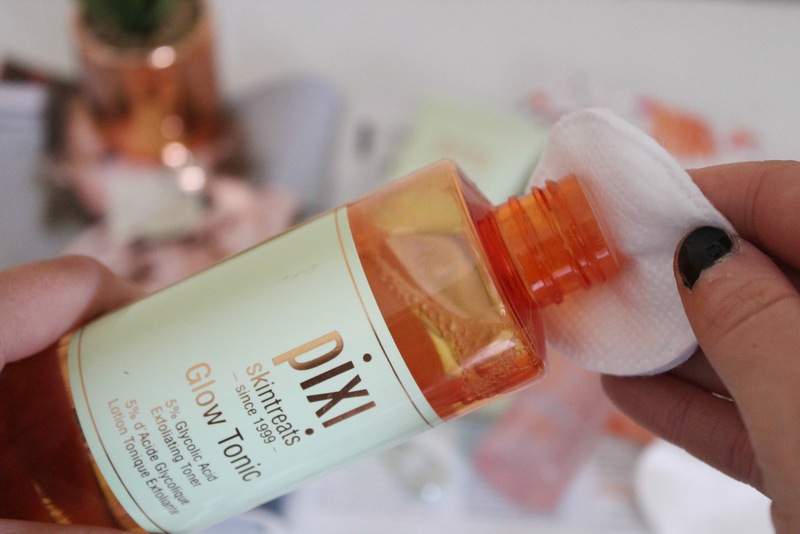 Glow Tonic is one of those cult products that you can't not buy from Pixi - I've had my on this for a while after seeing it do the rounds on a few other blogs and I whole heartedly stand by every positive review of this product, after two weeks it has made it to the Holy Grail product list and will remain there forevermore. Also containing glycolic acid as well as aloe vera and ginseng, the glow tonic also works to gently exfoliate as well as smooth the complexion and aid cell renewal providing skin with a natural healthy glow. Being alcohol free and filled with such goodness, it's another product that's perfect for sensitive skin. I've found that my skin is much calmer and 100% blemish free since using this and as a bonus, it smells beautiful. 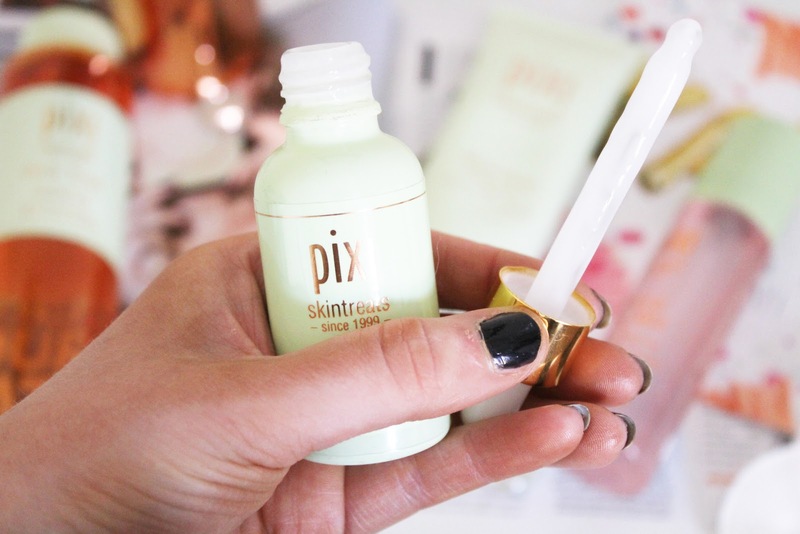 Having ridiculously dry skin meant that I had to choose a moisturising product and the Hydrating Milky Serum sounded exactly like what my skin needed. the serum comes with a droplet applicator and is the most creamy mil-like consistently possible, it contains rose flower extract jojoba oil and aloe vera to sooth and moisturise the skin as well as glycerin that works to trap the moisture in the skin and create plumped effect adds to healthy glow. I use the serum morning and night after cleansing, just a few drops to my forehead and cheeks and chin provides more than enough moisture to make my skin feel hydrated and look fresh. 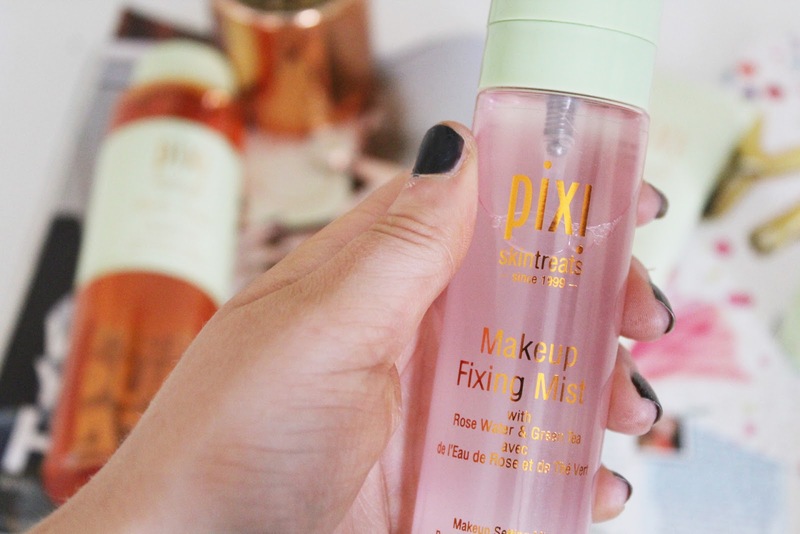 The Makeup Fixing Mist does much more than just fixing makeup in place, it also works as primer and can be used throughout the day to moisturise and refresh makeup - perfect for the warmer months and for matte foundations that can always do with a touch up. The mist is infused with greet tea and rose water and smells divine, it could probably past as a body mist. As well as locking moisture and make-up in place it works to create a soft-focus look and is a much a key to creating a look thank it it to preserving it. Being mid-range to expensive (for my budget) I would advice researching products or buying smaller sixes before investing in full sized products. The stand out product that I feel has to be tried is the Glow Mist because I think it really would be perfect for anyone's skin. As for the products, I don't think I can live without them now which is great for my skin but not so much for my bank balance. That being said, the longevity of the products seems to be economical, I have only just reached the label of the glow tonic after three weeks of use and I have what appears to plenty of everything else left. Exactly how long they last will provide a perfect idea of how much product you get for your money. Overall, I'm super happy with my updated skincare routine 👍🏼. I definitely want to try the glow tonic! I've been trying their exfoliator at the moment and been really enjoying it!